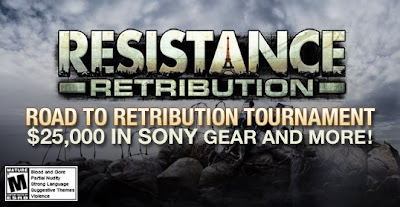 Sony Computer Entertainment America (SCEA), Bend Studio and Global Gaming (GGL) is currently running the $25,000 Road to Resistance: Retribution Tournament. The tournament offers a 2v2 and 4v4 format to enter into. The qualifying ladder portion of the tournament ends on May 10th. This tournament is open to legal residents of Canada and the US. For more details on this tournament and to enter, click here.